An estimated 35,000 walrus were photographed Saturday about 5 miles north of Point Lay, according to the National Oceanic and Atmospheric Administration. Point Lay is an Inupiat Eskimo village 700 miles northwest of Anchorage, Alaska. Andrea Medeiros, spokeswoman for the U.S. Fish and Wildlife Service, said walrus were first spotted Sept. 13. They have been moving on and off shore. Observers last week saw about 50 carcasses on the beach from animals that may have been killed in a stampede. The agency was assembling a team to determine their cause of death. Pacific walrus spend winters in the Bering Sea. Females give birth on sea ice. They use ice as a diving platform to reach snails, clams and worms on the shallow continental shelf. Unlike seals, walrus cannot swim indefinitely and must rest. They use their tusks to pull themselves onto ice or rocks. As temperatures warm in summer, the edge of the sea ice recedes north. Females and their young ride the edge of the sea ice into the Chukchi Sea. That's the body of water north of the Bering Strait. In recent years, sea ice has receded north into Arctic Ocean water. Depths there exceed 2 miles and walrus cannot dive to the bottom. Walrus in large numbers were first spotted on the U.S. side of the Chukchi Sea in 2007. They returned in 2009. In 2011, scientists estimated 30,000 walruses along 1 kilometer of beach near Point Lay. Scientists are now seeing this phenomenon because of the loss of sea ice as the climate warmed. the edge of the sea ice recedes North. I think that this is a amassing thing that has happened. I hope that you like this article too.I approve this to others and hope you like it. That is amazing that 35,000 walrus come ashore in Alaska. It is amazing how they are all together. All it looks like is a big potato from the photo. this is really really amazing. This kind of reminds me of the whales that were trapped under the ice because it froze too early expect this time the walrus have to find elsewhere to rest because the ice has receded. 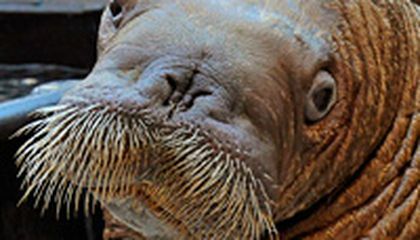 This article got me hooked because when I saw the picture of that many walrus and it mentioned 35,000 I had to check it out. I liked this article because I like sea life a lot and it was interesting to find about why the walrus were doing this and what their habits are. 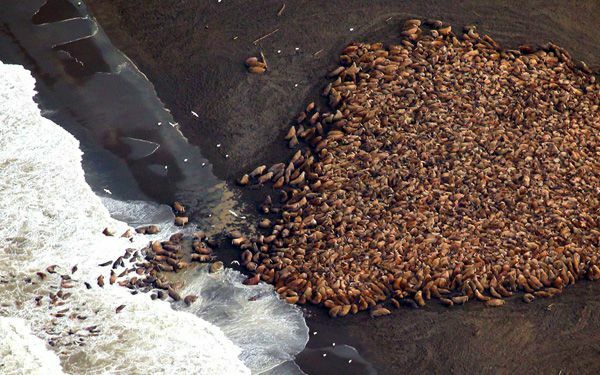 That is a lot of Walruses in Alaska! If they made even more Walruses that is going to be crazy.Still thirty-five thousand Walruses = Craziness. It's so sad that our uncleanliness is forcing these magnificent animals to migrate to other places. Global warming is really affecting animals all over the world now. Walrus are leaving their icy homes because the ice has receded past the depth where they can dive for food. They are forced to move away from the ice where the females give birth and into warmer shallower areas because they need to be able to rest and eat. We need to save these creatures from suffering and stop polluting the Earth. I think 35,000 walrus is so crazy. I wonder why they all came to shore. It is weird that there are so many in one place. Could be caused by global warming?